If there are lots of text messages on your iPhone, you may need to manage them to make your iPhone operate more efficiently. You can delete the unnecessary messages or just export text messages from iPhone to computer for backup. As for how to delete text messages on iPhone and how to backup messages on iPhone, you can check out this guidance to assist you. 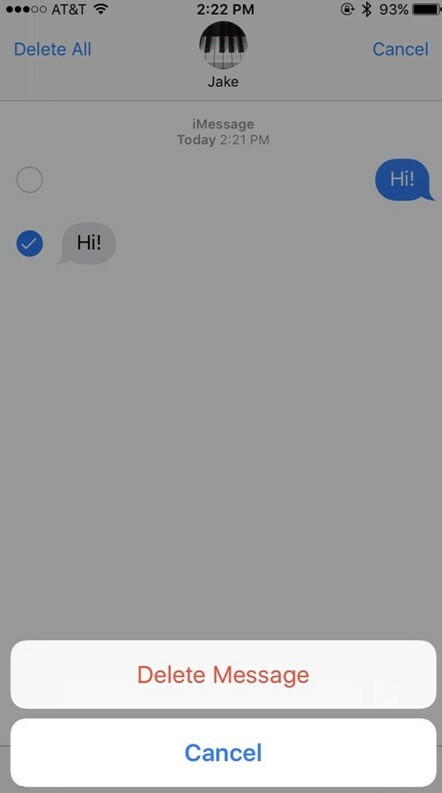 If you want to know how to delete text messages on iPhone, you can have a look at this solution. This method can assist you to achieve your aim with several clicks on iPhone. Follow me to check out the detailed contents on how to delete text messages on iPhone one piece at a time manually. 1. Tap the “Messages” app on iPhone and then click on the conversation that includes the text messages that you want to delete. 2. When the dialogue of the message is open, you need to click and hold the message you want to delete until a menu pops up. After that, tap the “More…” button in the menu. 3. 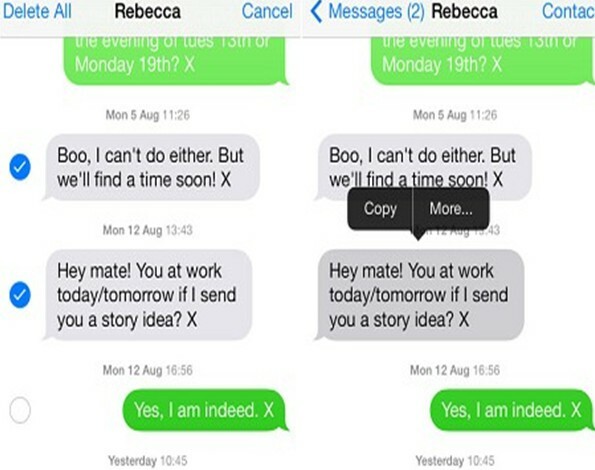 A circle will show up next to each text message. Tap the circle next to a message to put a checkmark beside it. Afterwards, you need to tap the trash icon at the bottom left corner of the window. Tap “Delete Message” button in the menu that shows up. Sometimes, you may want to delete one message that you do not want to see, and this solution will be a good choice. If you do not want to delete text messages on iPhone one by one, you can continue to read the following content to know how to delete text messages on iPhone multiple pieces at a time. The first solution has introduced how to delete saved messages one piece at a time. If you want to know how to delete multiple text messages on iPhone manually, you can continue to read the contents in this part. 1. Move to click on “Settings > Messages” on your iPhone. 2. After that, you need to scroll down to the area of “Message History” and click on “Keep Messages” to tick the 3 options: 30 Days, 1 Year, and Forever. If you select the option of “30 Days”, your text messages that have been saved more than 30 days will be deleted. The text messages that have been saved more than a year will be removed when the option of “1 Year” is selected. No text message will be deleted when you choose “Forever” option. 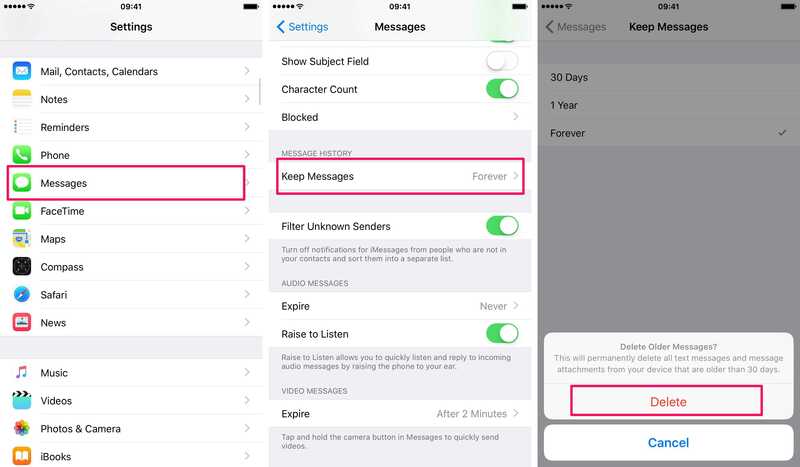 The fastest method to delete text messages on iPhone at once is to select the option of “30 Days” or “1 Year”. 3. In the next tab, you need to tap “Delete” button to confirm to remove iPhone text messages thoroughly at a time. This solution will not remove all text messages, but it will surely assist you to solve how to delete saved messages conveniently. If your iPhone storage is running out, you can make use of this way to deal with how to delete saved messages on iPhone easily, which can make room for other files on iPhone. If you want to handle how to delete text messages on iPhone more professionally, you can take advantage of a powerful tool to help you. Here I strongly recommend you use iTransfer to assist you to achieve your aim. 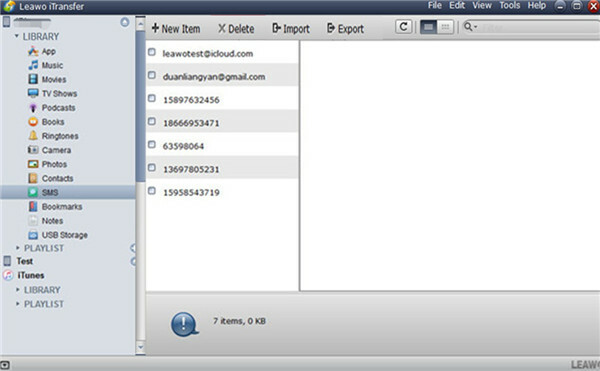 Leawo iTransfer has user-friendly interface and allows you to manage 12 kinds of files, such as videos, messages and contacts. It can assist you to solve how to delete saved messages on iPhone without any difficulty. The detailed steps are shown below. Run iTransfer and plug iPhone into computer via matched USB cable. Navigate to click on “iPhone icon > LIBRARY > SMS” to check out all text messages on iPhone. Tap on the box next to the message that you would like to delete from iPhone to put a checkmark in the box. 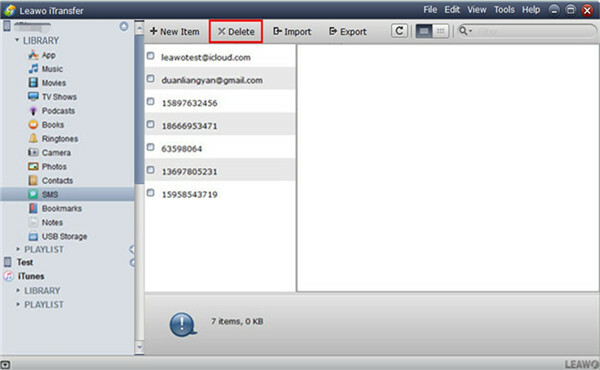 Click on the “Delete” button in the interface to remove iPhone messages that you have selected. You can also right click on the text message you would like to remove by tapping on “Delete” on the pop-up dialog. After you have deleted the text messages on Leawo iTransfer, the iPhone text messages have also been removed permanently. 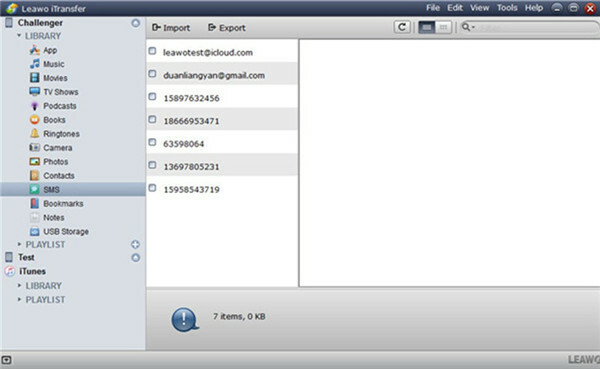 To find them back, you can use Leawo iOS Data Recovery to recover deleted text messages from iPhone. 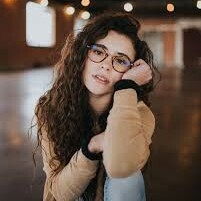 You can make use of this tool to delete single or multiple text messages easily and professionally. If you do not want to delete text messages on iPhone to make room for other new files, you can also download text messages from iPhone to computer for backup. 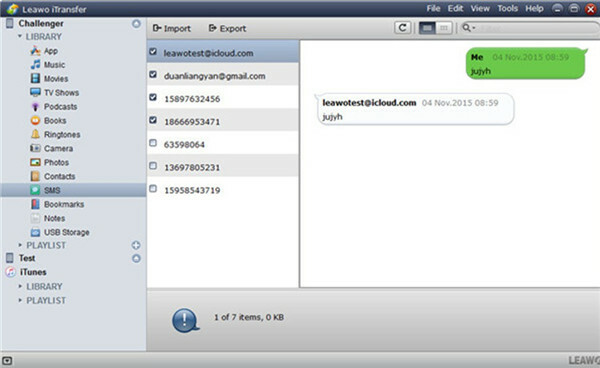 Leawo iTransfer can also be used to export text messages from iPhone to computer for backup. You can use it to back up other files as well, such as photos, songs and contacts. Now let’s begin to see how to backup messages on iPhone to computer via iTransfer. Launch iTransfer and use a proper USB cable to insert iPhone into PC. Click on “iPhone icon > LIBRARY > SMS” to see all iPhone messages. If you want to view your iPhone text messages more clearly, you can refer to: 2 Apps to View iPhone Text Messages on Computer. Tap the box next to the message that you want to delete to put a checkmark in the box. You can also select messages by holding Ctrl/Shift key, and then right click on the selected messages. After you have chosen the messages according to the contacts, you need to tap “Export” at the top middle of the interface. 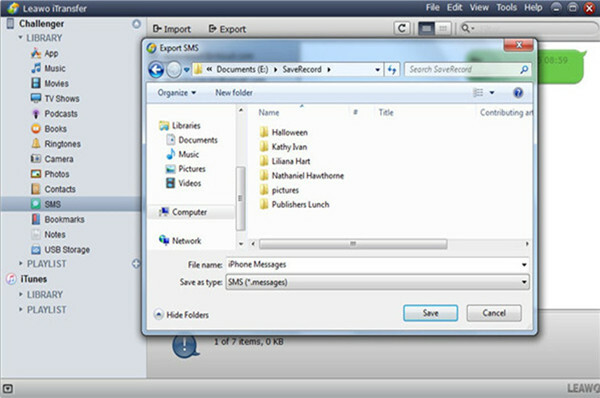 In the pop-up panel, select a folder on PC to save the exported text messages. Enter a file name and select “SMS (*.messages)” from “Save as types”. In the end, tap the “Save” button. Wait until the process is over, and then you can download text messages from iPhone to PC successfully. Leawo iTransfer is really a wonderful tool to help you to export text messages from iPhone to computer. Have a try and you can’t miss it.